- Your love is something special. Your wedding rings should be, too. How's this for something different? 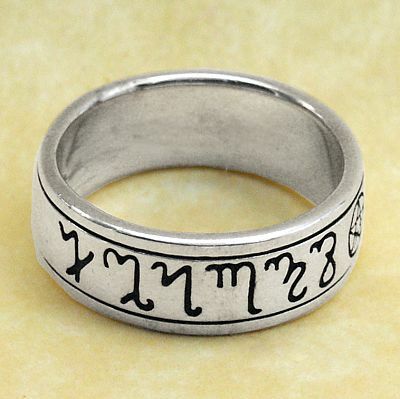 A sterling silver handfasting ring inscribed with Theban runes which spell out the words "Hearts As One". The inside of the band has the corresponding inscription in English. Isn't that a lovely sentiment for a couple just starting out their life together? 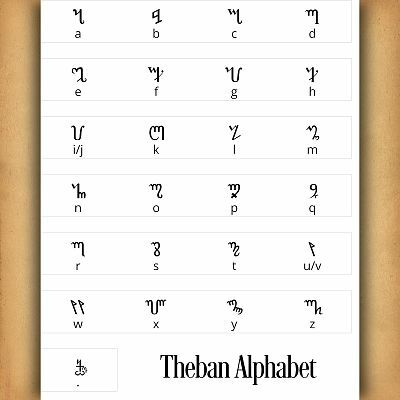 Theban runes are also known as "witch runes" or the "Honorian alphabet". These rarely seen ciphers lend an air of mystery to the handfasting ring, and along with the pentacles separating the words, make this ring a symbol of faith just as much as a it is a symbol of commitment and devotion. Ideal for your wiccan wedding. Choose Size... Size 4 Size 5 Size 6 Size 7 Size 8 Size 9 Size 10 Size 11 Size 12 [OUT OF STOCK] Size 13 Size 14 Size 15 Please choose the Size. Is this ring for guys or gals? Unisex, definitely. Anyone can wear this ring proudly. The band is 5/16" wide, and looks great on any size finger. Just like a marriage, a handfasting is a commitment between two people. 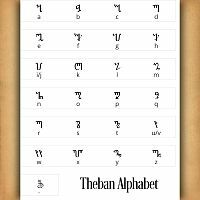 The term has been used as far back as the Middle Ages, where it could be used to mean either an engagement or a wedding. In modern times, people often use "handfasting" to refer to a wedding ceremony with pagan or traditional customs, such as using a ribbon to bind the hands of the couple to "tie the knot", or jumping the broom together. 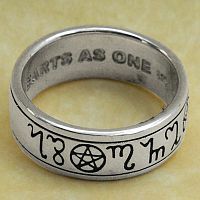 Can I wear this ring even if I'm not pagan? Well… yes. But be aware it may lead to some awkward questions from your church-going friends. Do you have any other questions about our Silver Pagan Handfasting Ring? My husband and I ordered 2 of these for our Handfasting in 2013. It is now 5 years later, and they're still just as beautiful as the day they arrived! The photo really doesn't do it justice. I can't tell you how many compliments I've received. If you're looking for rings that will be treasured for a lifetime, this is it! It's exactly what I wanted! The detail is amazing!! Just got the rings my partner and I chose for our Handfasting ceremony and we are absolutely delighted! Great quality, beautiful artwork, we love them! Delivery was fast, overall excellent service, will definitely recommend Gryphon's Moon to our friends! I just got my ring in the mail today, and I have never been more pleased! The picture truly doesn't do the ring justice. 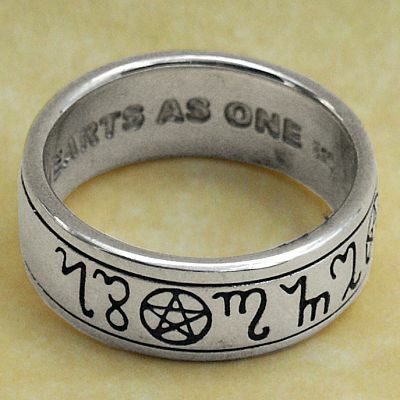 This is the ring that my fiancé plans to give to me on our wedding/handfasting day on Monday, April 14th (just a few short days away). I am more than pleased with the customer service, and how prompt an email can be expected when something is wrong with an order, email address, what ever the issue may be! Thank you so much, Gryphons Moon for being so amazing!! I definitely plan on ordering more in the future! My wife & I selected these bands back when we first became engaged. We were finally able to order mine last year & I will be ordering hers in the next couple of weeks. The detailing on this band is beautiful. I wear this band proudly & it NEVER leaves my hand. Love this band. The only problem I had with this band is the chemical they use to blacken the writing. It was not completely washed off & I ended up having a reaction to the chemical due to my sensitive skin. A quick wash of the ring in warm, soapy water followed by a quick dunk in jewelry cleaner to restore the shine fixed this problem & I have had no other issues with it. Just remember to wash the bands once you get them if you have sensitive skin & you will love these bands as much as my wife & I do. 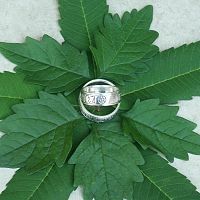 We used these rings for our handfasting at 10am on the 10th of Oct 2010 and they have endured many a rough moment and still hold their shine well and we both love them and each other ;) I am of the belief that this design will soon take over the standard wedder throughout the world. My Fiance bought two of these for us to exchange during our handfasting next year and they are beautiful, cant wait to wear it permanently. Love the writing inside, Hearts as One. I ordered these rings for my fiancée and I and when they arrived we simply fell in love with them. The shine and inscriptions both on the outside and inside of the rings was beautiful. We both keep them shining bright as well as we are planned to be married sometime in the fall of 2017. 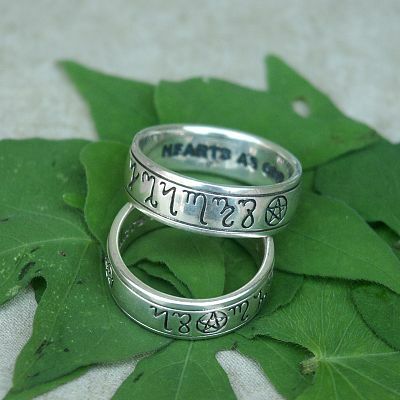 My fiance and i got these rings for our hand-fasting ceremony. and all we can say is WOW.. the pictures do not do these rings justice. They are beautifully crafted and fit better than we could have hoped! My handfasting was February 14, 2009 and we still both get compliments on our rings. My husband lost his recently and has been very upset about it. I am glad that this ring is still available for us to replace it. wearing, we did have to exchange them for a larger size. Service was wonderful. them for their rings. They'll be our wedding gift to them. Aboslutely love the rings!! The costumer service is excellent! had to exchange my ring cause it was to small and i had a very fast response and reshipping! will definetly buy again from Gryphon's Moon! I really love my ring, it is a nice fit, looks great on my finger, great pice. The ring is to be used as my handfasting ring, which will take place in May 2010. Gryphon's Moon is very dependable and very fast on getting the order out. This is my first time to order from Gryphon's Moon, but this will not be my last. And yes, I will definitely order again. I really love my ring, it’s a nice fit, looks great on my finger, great pice. The ring is to be used as my handfasting ring, which will take place in May 2010. Gryphon's Moon is very dependable and very fast on getting the order out. This is my first time to order from Gryphon's Moon, but this will not be my last. And yes, I will definitely order again. we loved our rings from the the frist time we saw them in CA. 14 years ago when we got them in prewter. Since then I replaced mine with silver. It's the best wedding rings I've seen. we loved our rings from the the frist time we saw them in CA. 14 years ago when we got htem in prewter. Since then I replaced mine with silver. It's the best wedding rings I've seen. This is an awesome ring. I wear it everyday. 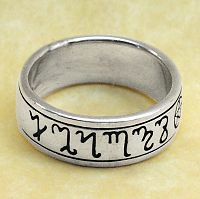 I gave this ring to my non-pagan husband of 27 years as an anniversary gift. He absolutely adores it and never takes it off except to polish it. It's garnered alot of attention, all positive, from everyone that sees it. Magnificent artwork and smooth edges. Very comfortable as well as beautiful! This is a beautiful ring. It's very shiny, the details are wonderful and it fits perfectly on his hand. He could not be happier with his ring. Thanks so much! I THINK THE RING SAYS IT ALL. HEARTS AS ONE. NO BEGINING NO END. The rings that my husband and I bought were just beautiful. They fit perfictly ,and it helped to make our Handfasting ceremony extra special.Thank you for always having quality products! These rings are sublime. The quality of the engraving is precise and clear. They are heavy, much heavier than I would have expected. My only criticism is that the US sizing does not have as many options as that used in the UK and resizing the rings (due to the internal and external engraving) is impossible without compromising the integrity of the symbols.